Christopher Secker is a doctor and basic scientist. He has been working for several years on the molecular mechanisms of neurodegenerative diseases. Since September 2016 he has been an ALS Fellow at the Berlin Charité and has been researching the causes of amyotrophic lateral sclerosis. This experimental work, which is being carried out in cooperation with the Max Delbrück Center for Molecular Medicine (MDC) and the German Center for Neurodegenerative Diseases (DZNE), focuses on the neuronal protein misfolding in ALS, its cause, and the effects of ALS -associated protein changes on their cellular function. Prior to this, Christopher Secker was involved in experimental work in the Wanker working group at the Max Delbrück Center on amyloid deposition in Alzheimer’s dementia. 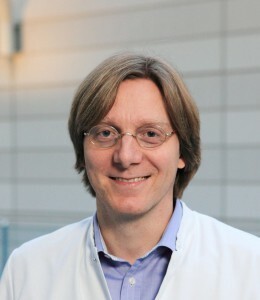 Christopher Secker completed his medical degree at the University of Heidelberg. He gained his experimental expertise at numerous stations in biological research laboratories.